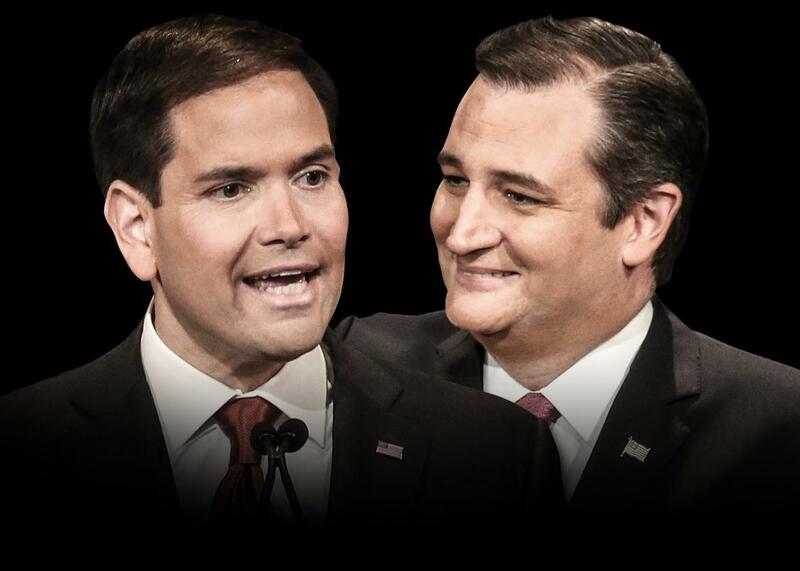 Marco Rubio, Ted Cruz won the Fox Business debate. Marco Rubio and Ted Cruz. Photo Illustration by Holly Allen. Photos by Scott Olson/Getty. Unlike the past two Republican prime-time debates, there was no clear winner on the Fox Business stage Tuesday night. Sens. Marco Rubio and Ted Cruz, though, appeared to do the most to help themselves at a time when a chaotic nomination race is starting to slowly come into focus. The two were poised and confident throughout the night, inserting themselves into the conversation when it served them and playing it safe when it didn’t. Rubio arrived in Milwaukee as many pundits and politicos’ favorite for the GOP nomination, and he’ll leave that way too. Cruz, meanwhile, stood out at a time when his slow-but-steady strategy is beginning to take hold. While Rubio was able to avoid his biggest weakness, Cruz was running toward his strength to fire up his base. When the moderators pressed the Texas firebrand on his proposal to raise the retirement age and cut benefits for future retirees, Cruz quickly dismissed the question to return to Jeb Bush’s earlier claim that the GOP hard-line positions on immigration would hurt them in the general election. “What was said was right,” Cruz bellowed, “the Democrats are laughing—because if Republicans join Democrats as the party of amnesty, we will lose.” The crowd in Wisconsin ate it up. Those small stumbles aside, though, both men dominated the stage in ways that they hadn’t before. Rubio is unlikely to benefit as much from his performance in Milwaukee as he did from Jeb’s performance in Boulder, Colorado, when the former establishment favorite tanked in the last debate, but he survived his first debate as everyone else’s favorite target. Cruz, meanwhile, expanded his debate repertoire beyond just bashing the liberal media—though he did manage to do that too. And both men were able to take big swipes at Hillary Clinton near the end of the debate, billing her as a successor to what they described as the failed policies of Barack Obama. Tuesday’s debate, then, likely didn’t change the dynamics of the GOP race. But for Rubio and Cruz, that’s the best prize they could have asked for.